Below are all of the questions we could remember having been asked in the past. If you have a question that's not on here, please feel free to email thehotshots@alivenetwork.com or call our Alive Network agent, Gemma on 0845 226 3116. Are Can we make DJ requests in advance to my event? Why should I book The Hot Shots? Do The Hot Shots have any specific requirements? Do The Hot Shots offer any additional services? • Below are the best timings (through experience) for Weddings performances, 7.30pm-12am with 2x 60 minutes sets. • Please plan sets around the evening food. Do not have the band start at 8pm if the buffet is then ready to come out at this time also as your guests will want to eat in peace. • We suggest 2x60 minutes sets over 3x40 minutes where possible. We are a party band Essex, but we do travel UK wide and even internationally. 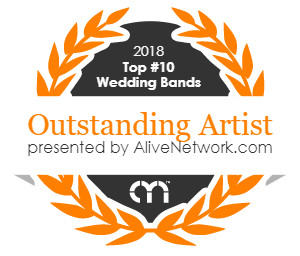 Due to the nature of our work, it is very rare that we get an opportunity to play public gigs, especially as one of the most in-demand wedding bands in the UK! However, on the rare occasion we get to play publicly, we’ll post the details of these events on our facebook page. We are happy to consider learning your special song. It largely depends on whether the particular song fits our playing style and sound. It would be difficult for us to pull off certain songs with orchestral backing, for example, due to our instrumentation, but we will sure give it a go. At the time of booking us, please let your agent know if there’s a particular song you’d like us to consider learning so we have enough time to learn it well. We believe in giving you a true insight into our live performance energy and sound. We had a live DVD produced of our BugJam festival performance to highlight our, energy, musicianship and charisma. We want you to get a feel of the interaction and enjoyment your guests will have from having The Hot Shots play at your event. No gimmicks or studio overdubs. Please check out our BugJam video on our website. We also accept informal enquiries via our Facebook page (www.facebook.com/thehotshotsuk), where we will be happy to talk through your event in person. The Hot Shots live sound system is a collection of some of the most desirable audio equipment available on the market, including a Yamaha 32 channel digital mixing console, a 4000 watt active speaker system and wireless in-ear monitoring for each member. Their combined collection of instruments, amplifiers and microphones, both vintage and modern includes PRS, Gibson, Fender, MusicMan and EVH electric guitars, Martin and Taylor acoustic guitars, Warwick and Fender basses, Fender and TC Electronic amps, Tama drums and hardware with Zildjian A & K custom cymbals, and an array of Shure and Sennheiser microphones. We are equipped with a state of the art LED lighting system that provides both the stage and dance floor with the ultimate visual effects. We also own two 1500 watt strobes and smoke machine, which can be included into our performance upon request. We usually play two one hour sets. This can also be divided into three 40 minute sets if you prefer. We have enough repertoire to cater for 3 hours of live music, with enough variety to keep your party going! We also offer an acoustic upgrade option which consists of 2 x 30 minutes of carefully selected acoustic music, perfect for during your meal or drinks reception. We can provide this service as an acoustic duo or 4 piece (live lounge style) group. We usually start our first set at around 8.30, and play our second set in the final hour of the evening, but again we are totally flexible with this. Arrival and finish times are 5pm and midnight as standard with early arrival and late finish fees applicable outside of these timings. The Ultimate Live Band Experience! The Hot Shots have carefully constructed sets to cater for every type of performance with the ability the gauge the audiences needs and venue requirements throughout the whole performance. From the 50s to todays chart toppers, The Hot Shots have something for everyone with hugely recognisable hits by bands such as; The Beatles, Queen, The Killers and Kings of Leon to their own 'Rockier' versions of songs by artists such as Bruno Mars, Daft Punk, Jessie J and Stevie Wonder. You are guaranteed to be blown away by The Hot Shots amazing musicianship, stage presence and professional, slick appearance. The Hot Shots extensive set list means they can offer quantity as well was superb quality with over 4 hours of outstanding band repertoire and over 2 hours of acoustic duo music. Prices vary slightly based on the time of year, the location of your event, timings, and any upgrade options. Please use the booking widget in the sidebar to get an instant quote. It only takes a minute! Yes. We have hundreds of testimonials from previous satisfied clients on our website. Check out our previous client testimonials here! We always make sure that our volume levels are such that people at your event can still converse, but really feel as though they are at a gig when they're on the dance floor. Being a guitar based rock and pop function band, the nature of the music we play means that we can only turn down so far! If your chosen venue has a DB limiter, please discuss this with your agent at the time of your enquiry - There’s every chance that we (or one of our fellow agency bands) have performed at the venue before, but if not, it’s worth discussing to make sure that the performance you will receive from us will not be compromised. However, if your venues decibel limit is restrictively low, we are more than happy to provide an acoustic version of our performance which, while obviously being quiter, will still provide you with music that’s great to dance to. The Hot Shots offer a number of additional services at very competitive rates: From ceremony music, acoustic sets during dinner, additional/extended DJ service, Microphone hire and live song requests. If you would like more information regarding the above options please contact us via email to discuss.